It is known that amino acid oxidation is increased in tumor-bearing rat muscles and that leucine is an important ketogenic amino acid that provides energy to the skeletal muscle. To evaluate the effects of a leucine supplemented diet on the intestinal absorption alterations produced by Walker 256, growing pregnant rats were distributed into six groups. Three pregnant groups received a normal protein diet (18% protein): pregnant (N), tumor-bearing (WN), pair-fed rats (Np). Three other pregnant groups were fed a diet supplemented with 3% leucine (15% protein plus 3% leucine): leucine (L), tumor-bearing (WL) and pair-fed with leucine (Lp). Non pregnant rats (C), which received a normal protein diet, were used as a control group. After 20 days, the animals were submitted to intestinal perfusion to measure leucine, methionine and glucose absorption. Tumor-bearing pregnant rats showed impairment in food intake, body weight gain and muscle protein content, which were less accentuated in WL than in WN rats. These metabolic changes led to reduction in both fetal and tumor development. Leucine absorption slightly increased in WN group. In spite of having a significant decrease in leucine and methionine absorption compared to L, the WL group has shown a higher absorption rate of methionine than WN group, probably due to the ingestion of the leucine supplemented diet inducing this amino acid uptake. Glucose absorption was reduced in both tumor-bearing groups. Leucine supplementation during pregnancy in tumor-bearing rats promoted high leucine absorption, increasing the availability of the amino acid for neoplasic cells and, mainly, for fetus and host utilization. This may have contributed to the better preservation of body weight gain, food intake and muscle protein observed in the supplemented rats in relation to the non-supplemented ones. Cachexia is a debilitating state and still poorly understood syndrome of progressive body weight loss present in many types of cancer. It is characterized by host involuntary weight loss, anorexia and metabolic alterations . The anorexia-cachexia syndrome is a complex metabolic and behavioral alteration correlated with poor outcome and compromised quality of life, leading to death [2, 3]. Loss of protein is a major factor in the short survival time of patients with cachexia and may also contribute to the immunologic abnormalities . Despite the controversy about the underlying molecular mechanism of cancer cachexia, the growing tumor has a considerable demand for essential amino acids and glucose. The tumor daily nutrient needs can increase considerately, especially for leucine . As a result of the demand for leucine there is an amino acid flux from muscle to the tumor associated with muscular wastage in the host . Muscle wasting may be due to increased protein catabolism, decreased protein synthesis, or a combination of the two . Smith and Tisdale  demonstrated that serum from cachectic animals was able to increase protein degradation in isolated gastrocnemius muscle, while serum from mice bearing MAC13 adenocarcinoma, which is not associated to cachexia, did not increase protein breakdown. Branched-chain amino acids (BCAA: leucine, isoleucine and valine) are essential nutrients for both humans and animals, making up to 40% of the animal daily requirements of indispensable amino acids for humans , leucine alone representing 8% of body protein in human . In the study of the mechanism that leads to protein waste, particular interest has been given to the metabolism of BCAA . The carbon skeletons arising from transamination of BCAA provide the major source of metabolic fuel for skeletal muscle. Argiles and Lopez-Soriano  have shown that during cancer, the BCCA plasma levels were often increased and their turnover rates altered. It has been previously demonstrated that in vivo leucine oxidation to CO2 is enhanced in tumor-bearing animal [9–11] and associated to an increased amino acid turnover. Experiments studying reciprocal influence between cancer and pregnancy still remain controvertial indicating that, in some cases, pregnancy has a protective mechanism against tumor  or that there is an increase in fetal resorption incidence and a decrease in fetal weight [13, 14]. In our previous studies, it has been shown that a leucine supplemented diet could prevent, in part, the high cell nitrogen wastage (expressed by non-collagen nitrogen) in pregnant tumor-bearing rats . Amino acids absorption can occur by co-transport system and facilitated transport systems through cellular pathways. The intestinal amino acids transport capacity is related to the animal age and depends on the microvilli and the number of carrier on the brush border . The determination of nutrients or amino acids absorption in certain pathologies is an important condition to assure the best dietary program to be given in these cases. Furthermore, this is an important issue in the study of cancer, since altered intestinal absorption may alter blood chemistry and contribute to anorexia genesis. To investigate the effects of a leucine supplemented diet on leucine, methionine and glucose intestinal absorption in the presence of Walker 256 tumor growth was the main purpose of the study reported here. Young female Wistar rats (45 days old, N = 60) were obtained from the animal facilities of University of Campinas, São Paulo, Brazil. The females rats were placed with adults males (90–100 days old, 4 females: 1 male) in collective cages during one night (12 hours), in agreement with harem methodology . The first day of pregnancy was determined following detection of sperm in vaginal smear. All animals were kept in metabolic cages under normal conditions (22+2°C, 12/12 h light/dark cycle) with free access to water and food during 20 days. The semi purified control diet contained 18% protein, 63% carbohydrate, 7% fat, and 5% fibers – AIN-93G . High leucine diet contained 15% protein added 3% L-leucine and same amount carbohydrate, fat and fibers percentage as the control diet. The female rats were distributed into 7 groups: four groups were fed with semi-purified control diet: non-pregnant, C; pregnant, N; pregnant tumor-bearing rat, WN; pregnant pair-fed group, Np, receiving the same amount of food ingested by tumor-bearing group WN. Three other pregnant groups were fed with semi-purified leucine supplemented diet: pregnant, L; pregnant tumor-bearing, WL; and pregnant pair-fed rat receiving leucine supplemented diet in the same amount ingested by WL group, Lp. Groups WN and WL were subcutaneously implanted with Walker 256 tumor cell suspension (approx. 0,25 × 106 in 0,5 mL of saline) in the right flank of the rats. These pregnant groups were injected with tumor cells immediately after the detection of the pregnancy. The groups without tumor were injected with 0,5 mL 0,9%(w.v.) NaCl without anesthesia. All experiments were commenced between 8:00 and 10:00 am, and followed during 20 days after tumor implantation. General UKCCR (1988, United Kingdom Coordinating Committee on Cancer Research) for animal welfare were followed (Ethical Committee for Animal Research CEEA and COBEA, Brazil, no. 034-2). Food intake and body weight were measured every two days. Tumor weight was calculated from 3 orthogonal linear measurements using the weight dimension curves . After 20 days all experimental groups were submitted to continuing intestinal perfusion, as described by Gomes-Marcondes et al . The intestinal perfusate fluid samples were taken to measure leucine, methionine and glucose content after flux perfused solution containing 138,7 μmol/L glucose, or 167,5 μmol/L DL-methionine or 190,5 μmol/L L-leucine; polyethylene glycol (PEG, 4000 mo. Wt) was added to perfused solution as a tracer in nutrients uptake studies. The flow rate was 0,5 to 1,0 mL/min at 37°C, pH 7,0, during 60 min. The animals were killed after Nembutal hyper dose followed by cervical dislocation. Arterial blood samples were collected to determine glucose, total protein and, albumin and gastrocnemius muscle samples were weighted and determined the total protein content. Intestinal perfusate solution and blood glucose were determined by colorimetric method, Trinder . Methionine and leucine perfused solution were measured following the spectrophotometric methods described by McCarthy & Sulivan  and Rosen  respectively. Total protein content was analyzed using colorimetric method . The Kruskal-Wallis one way analysis  assessed statistical differences, using the GraphPad Prism, v 3.00 for Windows 98. The comparisons among groups were considered statistically significant when the P value was below 5% level. In this study, changes in body and tumor weight were longitudinally monitored. These data are show in Table 1. In both pregnant groups, the tumor growth promoted a sharp decrease in food intake; there was a 58% decrease in WN compared to N groups, and this decrease was less intense in WL group (50%). Since sharp decrease in food intake has been demonstrated in several studies with tumor-bearing organisms [2, 24], the same restriction in food intake was imposed to pair-fed groups in the present study. Body weight gain (total body weight on 20th day), food intake, tumor weight/carcass weight, fetal weight of the groups studied. Body weight gain was determined from the rate final body weight gain in relation to initial body weight gain (%). Food intake was expressed as a percentage of initial and final food intake (%) Data are reported as means ± SE from 10 animals per group. Groups: control (C); pregnant control (N); pregnant tumor-bearing (WN); pregnant control pair-fed to tumor-bearing groups (Np); pregnant control receiving a leucine supplemented diet (L), pregnant tumor-bearing receiving a leucine supplemented diet (WL) and pregnant control leucine pair-fed group (Lp). a p < 0,05 compared to control group (C); b p < 0,05 N vs WN and L vs WL. The body weight gain was significantly reduced in WN and WL groups compared to their respective control groups (50% in WN and 42% in WL group). In pair-fed groups the body weight gain was less impaired compared to tumor-bearing, around 42% in Np and 38% in Lp. The same tumor weight was observed in both pregnant tumor-bearing groups. The tumor/carcass weight ratio was around 7% in both groups. Fetal weight reduction (57% and 66%, respectively) was observed in WN and WL rats compared to pregnant rats. In pair-fed groups, the fetal weight decrease was not as intense as in tumor-bearing groups (around 20% in the both groups). Blood glucose, total protein and albumin data are shown in Table 2. Glucose, total protein and albumin serum of the groups studied. Data are reported as means ± SE from 10 animals per group. Groups: control (C); pregnant control (N); pregnant tumor-bearing (WN); pregnant control pair-fed to tumor-bearing groups (Np); pregnant control receiving a leucine supplemented diet (L), pregnant tumor-bearing receiving a leucine supplemented diet (WL) and pregnant control leucine pair-fed group (Lp). a p < 0,05 compared to control group (C); b p < 0,05 comparison among L, WL and Lp groups to N, WN and Np, respectively, c p < 0,05 N vs WN and L vs WL. Blood glucose decreased in pregnant groups, with and without tumor, in relation to non-pregnant group and this decrease was especially pronounced in WN groups. The leucine supplemented diet groups did not show alterations in blood glucose compared to non-pregnant group; but their values were significantly higher when compared to N, WN and Np groups, around 26%. Despite of similar serum total protein values, serum albumin was decreased in both tumor-bearing groups compared to respective non tumor-bearing groups (N and L, Table 2). 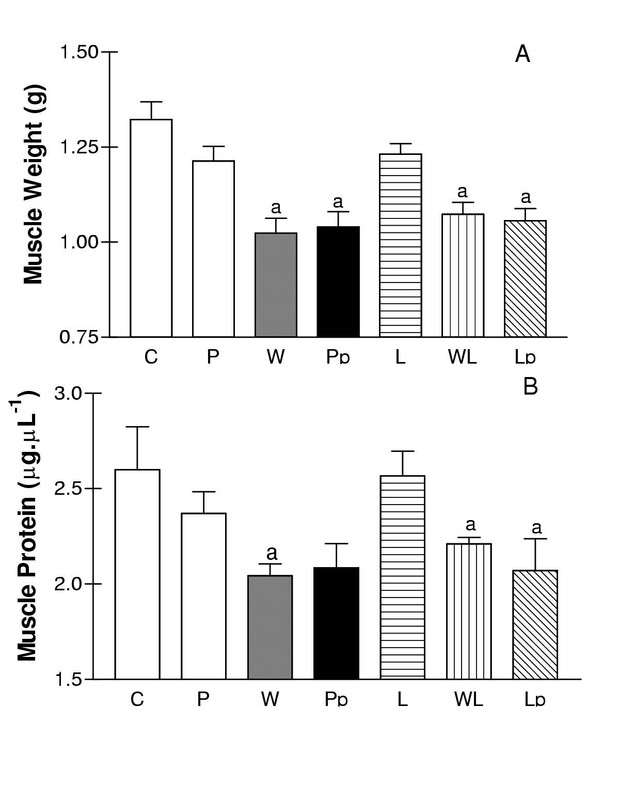 Tumor growth caused a pronounced decrease in muscle weight and protein content in WN and WL groups (Figure 1). Analyzing the leucine supplemented diet groups, although WL groups presented decrease in muscle protein content in comparison to L group, the values were slightly higher than in WN group. Changes in gastrocnemius muscle weight (A) and protein content (B) in virgin and pregnant groups. C, virgin control group; N pregnant group; WN pregnant tumor-bearing group; Np pregnant pair-fed group; leucine supplemented diet groups: L pregnant group; WL pregnant tumor-bearing and Lp pregnant pair-fed group. Data are means ± SE. a p < 0.05 vs control group (C), differences were determined using two-way ANOVA followed by Dun's test. Glucose, methionine and leucine absorption data are shown in Figure 2. The pregnant state caused a significant increase in glucose absorption in relation to non-pregnant state independently of the diet treatment. This increase was around two fold in both N and L groups (Figure 2A). Changes in glucose (A), methionine (B) and leucine (C) intestinal absorption rates in virgin and pregnant groups. C, virgin control group; N pregnant group; WN pregnant tumor-bearing group; Np pregnant pair-fed group; leucine supplemented diet groups: L pregnant group; WL pregnant tumor-bearing and Lp pregnant pair-fed group. Data are means ± SE. a p < 0.05 vs control group (C); b p < 0.05 comparison N vs WN, Np, and L VS WL; c p < 0.05 comparison normoprotein diet vs excess diet. Tumor growth promoted significant decrease in glucose absorption, of 50% in WN and 30% in WL groups. Both pair-fed groups also presented a decrease in glucose absorption (42% in Np and non-significant 25% decrease in Lp). Methionine absorption (Figure 2B) was slightly increased in N, but it was 5 fold higher in L group compared to non-pregnant group. Tumor-growth induced decrease in food intake reduced methionine absorption in WN (20%) and WL group (30%). Similar decrease in this amino acid absorption was observed in both pair-fed groups. In contrast, leucine absorption was not increased in the N group. On the other hand, in pregnant groups which received the leucine supplemented diet the absorption rate was 1.5 fold higher than non-pregnant group. Although amino acid absorption is controlled by carrier transport, which can be increased or unchanged by food deprivation, in tumor-bearing group WN the leucine absorption was higher compared to non-pregnant and pregnant group, suggesting increased nutrient offer to provide the neoplasic cells proliferation. On the other hand, the leucine supplemented diet group implanted with Walker 256 tumor presented a decrease in leucine absorption rate, differently from the pattern showed by WN group. This study demonstrates that the tumor growth produces some host alterations in pregnant rats, which can be attenuated by feeding leucine supplemented diet. In the present experiments we observed reduction in some parameters in WL group, such as food intake, body weight gain, muscle protein content, which were less pronounced than in WN group (Table 1 and Figure 1). Reduction in food intake is frequently observed in animals and patients with cancer and the mechanism involved in the genesis of this process still remains unknown. The tumor -bearing state is associated with a decrease in the host insulin: glucagon ratio. Increased glucagon levels can lead to anorexia, as well as increased hepatic gluconeogenesis and utilisation of gluconeogenic amino acids at the expense of protein synthesis, leading to a negative energy balance . In a recent study, decrease on food intake was observed in Walker tumor -bearing rats associated to highly decrease in carcass weight [13, 14]. Anorexia is always associated with a pronounced reduction in body weight gain, in spite of the fact that many studies have demonstrated that cachexia is a much more complex process than this simple association. Here in this study a significant reduction in body weight was observed in association with decrease in food intake, but these alterations were less pronounced in pair-fed groups than in tumor bearing groups. Depletion of lean body mass in cancer cachexia is a major factor responsible for the reduced survival time of cancer patients . Both reduced rates of protein synthesis and increased rates of protein degradation have been observed in biopsies of skeletal muscle from cachetic-cancer patients. While muscle-protein synthesis is depressed, syntheses of secretory proteins, such as acute-phase reactants by the liver are actually increased, so that there may be no change in total body-protein synthesis. However, in cancer patients muscle-protein synthesis only accounted for 8% of total body synthesis versus 53% for healthy control subjects. Loss of skeletal-muscle mass in both cancer patients and an experimental model of cachexia in the mouse has been shown to correlate with the presence in the serum of bioactivity capable of inducing protein degradation in isolated skeletal muscle. Tisdale and his group  have found a glicoprotein, named proteolysis-inducing factor (PIF), which can promote proteolysis in skeletal muscle of cachetic tumor and in non tumor -bearing animals. Our results showed decrease in muscle weight and protein content in tumor bearing rats, especially in the WN group. These results suggest that probably the leucine supplemented diet can improve the protein synthesis process or inhibit the degradation mechanism in tumor bearing host. Positive effects of leucine ingestion have been observed in tissues in catabolic states. McNurlan et al. have investigated the effect of leucine on protein synthesis in starvation and protein depletion, and suggested that both states were characterised by loss of body nitrogen and low rates of tissue protein synthesis. Under these conditions, Li & Jefferson  demonstrated that leucine stimulates protein synthesis in perfused skeletal muscle. Branched-chain amino acids (BCAA; leucine, isoleucine, and valine) have long been recognised as having a clear inhibitory action on proteolysis in skeletal muscle . Leucine has been shown to stimulate incorporation of amino acids into skeletal and cardiac muscle protein  and further to inhibit protein degradation in liver [29, 30] and skeletal muscle . In vivo studies in rats failed to demonstrate any effects of leucine on protein synthesis, but in humans, a mixture of amino acids was reported to stimulate protein synthesis . Studies with human subjects indicate that the nitrogen balance is improved in response to BCAA administration in conditions in which a negative nitrogen balance exists (e.g., starvation, surgery, acute hepatic failure, and cancer) [35, 32]. Schaur et al. found that dietary administration of BCAA (leucine and isoleucine) to tumor -bearing rats caused a limited increase in survival time and decrease in tumor growth. Moreover, it has been shown that insulin effects on muscle protein synthesis in vivo are enhanced by BCAA infusion . These results support the hypothesis that BCAA may give important signals in controlling muscle protein turnover. The results presented here clearly show that leucine is able to attenuate the muscle proteolysis in tumor-bearing rats. This effect was expressed in body weight gain, food intake and muscle protein content. An elegant experiment, done by Busquets et al. showed that leucine can influence gene expression for the different proteolytic system ubiquitin, inducing a significant decrease in the expression of the ubiquitin genes. Furthermore, the presence of the amino acid also caused a decrease in the C8 subunit of the proteasome. It has to be pointed out that the muscles did not show any significant change that could affect the ATP-requiring ubiquitin system in either ATP or phosphocreatine . Normally the processes of growth and metabolism in the mammalian foetus are supported by a constant uptake of oxygen, glucose, lactate, and amino acids across the umbilical circulation . If the availability of these substrates to the foetus is limited, foetal growth decreases. It is widely assumed that, once the chorioplacenta is functional amino acid nutrition occurs by the direct placental transfers of free amino acids from the maternal to the foetal blood stream . Intestinal sugar and amino acid transports are regulated independently. Inhibition of glucose absorption by high concentrations of certain amino acids has also been noted in mammalian cells in culture and in vitro [38, 39]. Intestinal amino acid transport is regulated in a complex way, such as the amino acid transporters are regulated semi-independently of each other, depending of the uptake of amino acids which move via different transporters respond differently to the same dietary amino acid  or to dietary levels of protein or protein hydrolysates [38, 39]. These factors may have contributed to the genesis of the pattern observed for the intestine in the present study. Although we observed differences in amino acid uptake related to leucine excess diet, we observed no such differences in D-glucose uptake, except in the pregnant groups. The effects of tumor growth in reducing glucose and methionine absorption rate were evident. On the other hand, leucine absorption was increased in the tumor bearing groups. Conversely, exchanging one dietary sugar for another has specific effects on sugar uptake but not on amino acid uptake . Simultaneous reciprocal changes in dietary protein and carbohydrate levels affect sugar uptake and amino acid uptake in opposite directions. Thus intestinal sugar uptake appears to be regulated by dietary sugars or carbohydrates, amino acid uptake by dietary amino acids or proteins. A priori, dietary supplementation by different amino acids might have led to different rates of amino acid transport through some non-specific mechanism, such as differences in intestinal mucosal mass or architecture or energy supply or Na+ gradient . Although previous studies have showed that there was a reduction on the ratio gut mass/ protein content in groups which were submitted to tumor implant or food restriction decreasing nutrient intestinal absorption , in the present study, this ratio can not be related to leucine absorption in pregnant tumor bearing rats. The decrease in glucose intestinal absorption was due to reduction in the food intake; as glucose absorption is up-regulated and depends on its carrier and the pregnant groups (P and L) were adapted to a non-specific regulation of carriers which can be accompanied by mucosal hyperplasia. The W and WL group showed decrease in glucose and methionine absorption compared to respective groups (P and L). However, analysing leucine absorption these tumor bearing groups showed changes in methionine absorption which can not be related to reduction in rat mass/ protein gut, but probably to other effects. 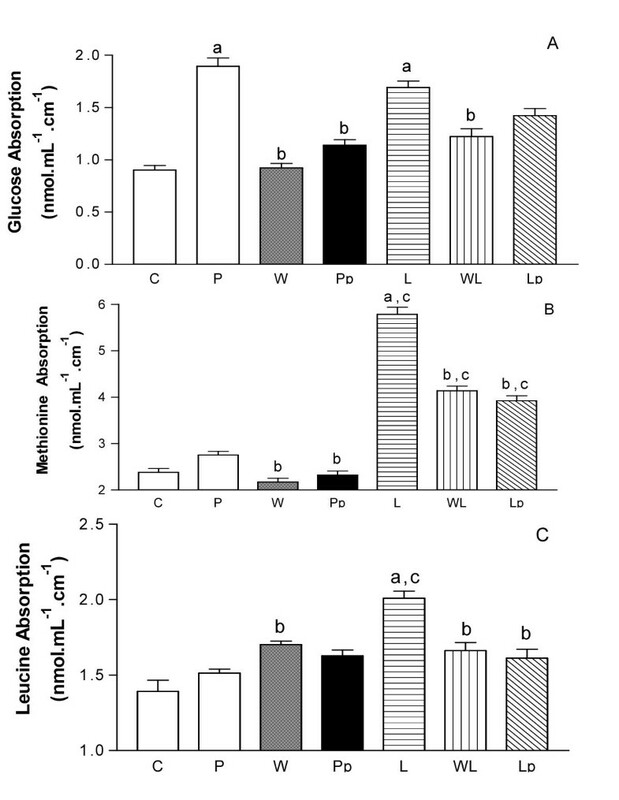 These facts might explain why methionine absorption was significantly increased in leucine supplemented diet group (L, WL and Lp, Figure 2). In addition, Hirst  reviewed the amino acid absorptive mechanisms and reported that during nutritional manipulations there are carrier adaptations, which could have accounted for the differences found in the tumor -bearing groups of the present study. Thus the amino acid transport alterations related to diet supplementation with different amino acids might involve specific effects on transporters, especially when associated with neoplastic growth. The mechanisms involved in the physiological impact of leucine on the effects of tumor growth remains to be further elucidated. Although, leucine did not appear to protect fetal growth impairment when a tumor is present, the major effect of leucine supplementation during pregnancy in tumor-bearing rats was to prevent experimental hypoglycaemia and promote high leucine absorption, maybe increasing the availability of the amino acid for neoplasic cells and host utilization. This may have contributed to the better preservation of body weight gain, food intake and muscle protein observed in the supplemented rats in relation to the non supplemented ones. We thank Dr. Juvenal Marcondes Neto for computing support. We are also grateful to Ajinomoto Interamericana Ind. & Com. Ltda, for providing L-Leucine, to Corn Products Brasil Ingredientes fro providing cornstarch and Roche Industrial & Quimica S.A. for providing the vitamin mix. Financial support: Fapesp (01/02135-3, 98/16022-1, 96/9463-6).